We recently modified our prediction scoring system “Estimation of Physiologic Ability and Surgical Stress” and have designated the current version mE-PASS. This scoring system has been designed to obtain predicted postoperative mortality rates before surgery and this study was performed to assess its usefulness in elective surgery for gastric carcinoma. We investigated seven variables for mE-PASS and evaluated the postoperative course in 3,449 patients who underwent elective surgery for gastric carcinoma in Japan between August 20, 1987 and April 9, 2007, in order to quantify the predicted in-hospital mortality rates (R). The calibration and discrimination power of R were assessed using the Hosmer–Lemeshow test and the area under the receiver operating characteristic curve (AUC), respectively. The ratios of observed-to-estimated mortality rates (OE ratios) were quantified as a measure of quality. The overall postoperative morbidity and mortality rates were 19.0 and 2.0%, respectively. R demonstrated good power in calibration (χ2 value, 12.5; df 8; P = 0.89) as well as discrimination (AUC, 95% confidence intervals: 0.80, 0.75–0.85). The OE ratios between hospitals ranged from 0.44 to 1.8. Overall, the OE ratios seemed to improve with time (OE ratio, 95% confidence intervals: 1.3, 0.73–2.4 for the early period between 1987 and 2000; 1.0, 0.59–1.7 for the middle period between 2001 and 2004; and 0.65, 0.36–1.2 for the late period between 2005 and 2007). Based on these findings, mE-PASS might be useful for medical decision-making and for assessing the quality of care in elective surgery for gastric carcinoma. Gastric carcinoma is the second leading cause of death from malignant disease worldwide . Although some chemotherapy regimens have recently been demonstrated to be effective for gastric carcinoma, surgical resection with lymph node dissection remains the mainstay of treatment for this tumor. In the 1960s, Japanese surgeons established an extended lymphadenectomy procedure known as D2 . This approach has become a standard procedure in Japan, as it has provided the lowest postoperative morbidity rates accompanied by good prolonged survival rates . General surgeons are taught this technique early during their surgical training. However, two European randomized controlled trials comparing D1 and D2 gastrectomy demonstrated a high surgical mortality exceeding 10% in the D2 group [4, 5], with no survival benefit for D2 over D1 lymphadenectomy. There were significant problems with these studies, including an association of the high morbidity and mortality rates in the D2 group with inadequate surgical training. D2 gastrectomy has a steep learning curve , and may be associated with a higher than expected surgical morbidity and mortality. Recently, several studies demonstrated that D2 lymphadenectomy could be performed with low morbidity and mortality at specialized centers in western countries, as well [7, 8, 9, 10] as in developing countries [11, 12, 13]. Therefore, in light of these findings, the assessment of surgical quality would be an important issue to evaluate when performing and comparing clinical trials around the world. We constructed a prediction scoring system for postoperative morbidity and mortality in elective gastrointestinal surgery, designated Estimation of Physiologic Ability and Surgical Stress (E-PSS) . Several cohort studies performed by the authors as well as other researchers have demonstrated reproducible outcomes in predicting adverse postoperative events [14, 15, 16, 17, 18, 19, 20]. We recently modified this system and designated this revised version mE-PASS. This modified system estimates postoperative mortality rates before surgery using a reduced number of variables . 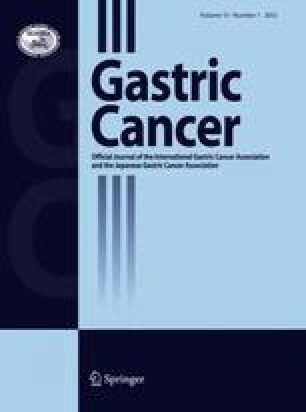 This study was performed to evaluate the predictive value of mE-PASS in elective surgery for gastric cancer, using data from Japanese regional referral hospitals. This study was performed according to the ethical guidelines on epidemiological research jointly developed by the Ministry of Health, Labour and Welfare and the Ministry of Education, Culture, Sports, Science and Technology, Japan. A subset of patients in previous multi-center cohort studies was reanalyzed in the present study [14, 15, 16, 17, 21]. Informed consent was obtained from each participant in these prospective studies [15, 16, 17, 21], but this procedure was waived for retrospective studies , because all data were obtained from medical charts and did not include any personal information that could identify any individual patient. For each of the studies, the study design was approved by the relevant ethics review board. Inclusion criteria for this study were patients who underwent elective resection of the stomach for gastric carcinoma between August 20, 1987, and April 9, 2007. Patients who underwent palliative surgery, such as gastrojejunostomy or simple laparotomy, were excluded from this study. These subjects were collected from 50 regional referral hospitals; 44 of these hospitals are associated with the National Hospital Organization. Most of the hospitals are medium-volume surgical centers, and usually managed approximately 200–800 cases of elective gastrointestinal surgery annually. In total, 3,449 patients met the criteria and were included in this analysis. Surgical procedures were selected based on tumor location, staging, and histological type, as described in the gastric cancer treatment guidelines in Japan . D2 gastrectomy was a standard procedure for every stage of gastric carcinoma until the late 1990s. Subsequently, modified gastrectomy (D1 + No. 7, 8a or 9 lymphadenectomy) has been preferred for early-stage carcinoma. When endoscopic treatment was impractical or incomplete, local resection of the stomach was usually indicated for differentiated carcinoma that was thought to be confined to the mucosa and measure 2 cm or less in diameter. We investigated seven variables for mE-PASS and evaluated the postoperative course in 3,449 patients who underwent elective surgery for gastric carcinoma. The parameters of mE-PASS are defined as follows . where X 1 is age; X 2, the presence (1) or absence (0) of severe heart disease; X 3, the presence (1) or absence (0) of severe pulmonary disease; X 4, the presence (1) or absence (0) of diabetes mellitus; X 5, the performance status index (range 0–4) ; and X 6, the American Society of Anesthesiologists (ASA) physiological status classification (range 1–5) . Severe heart disease is defined as heart failure meeting the criteria of New York Heart Association Class III or IV, or severe arrhythmia requiring mechanical support. Severe pulmonary disease is defined as any condition with a percent vital capacity of less than 60% and/or a percent forced expiratory volume in 1 s of less than 50%. Diabetes mellitus is defined according to the World Health Organization criteria . SSSf was determined using the median Surgical Stress Score (SSS) of the original E-PASS in 41 procedures . Values of SSSf in individual procedures are listed in Table 1. In-hospital mortality and postoperative complications were the primary and secondary endpoints, respectively. The Comprehensive Risk Score fixed (CRSf) and the predicted in-hospital mortality rates (R) were quantified for each patient, using the SSSf for the surgical procedure that was actually performed. Postoperative complications were defined as described previously , regarding pneumonia, abdominal abscess, fasciitis, bacteremia, septic shock, septic coagulopathy, anastomotic leak, wound dehiscence, gastrointestinal bleeding, gastrointestinal perforation, pancreatitis, myocardial infarction, cardiogenic shock, cardiopulmonary arrest, stroke, pulmonary embolus, hemoperitoneum, pulmonary failure, renal failure (Grades I and II), wound infection, urinary tract infection, pleural effusion, and hepatic dysfunction. Bacteremia was defined as any condition that included a clinical sign (either fever ≥38.5° C or shaking chill) and at least one blood culture that was positive for pathogenic organisms, as described previously . Anastomotic stenosis was defined as distinct stenosis that caused a delay in the resumption of solid food intake until after postoperative day 14. Ileus was defined as obstruction of the small intestines that required long tube decompression or reoperation. Some of these complications were grouped together as follows: cardiac complications including myocardial infarction, cardiogenic shock, and cardiopulmonary arrest; respiratory complications including pneumonia, pulmonary embolus, pulmonary failure, and pleural effusion; and general septic complications including bacteremia, septic shock, and septic coagulopathy. The severity of postoperative complications was classified using the morbidity score (MS) as described previously ; grade 0, no complication; grade 1, mild complications that are not life-threatening, such as wound infection; grade 2, moderate complications that are potentially life-threatening unless adequate treatment is performed, including pneumonia, anastomotic leakage, and ileus; grade 3, severe organ dysfunction that usually requires mechanical support, being equivalent to stage III in our own classification of organ dysfunction, but precise definitions were determined in seven organs ; and grade 4, in-hospital death due to complications. All statistical analyses were performed using the SPSS 17.0 (SPSS, Chicago, IL, USA) software program. Categorical variables were compared between groups using the χ2 test with Yates correction for continuity or, where appropriate, Fisher’s exact test. A two-tailed P value of less than 0.05 was considered significant. The discriminatory power of a model to discriminate patients who died during hospitalization from those who did not was assessed by calculating the area under the receiver operating characteristic curve (AUC) . The AUC ranged from 0.5 to 1.0 and the greater the AUC, the better the model. An AUC of 1.0 indicates a perfect model that shows 100% sensitivity and 100% specificity. In contrast, an AUC of 0.5 indicates a completely ineffective model unable to differentiate between real cases and non-cases. Calibration power was assessed by goodness-of-fit testing using the Hosmer–Lemeshow test . This test divides cases into 10 groups in order of predicted probabilities and computes a χ2 statistic from observed and expected frequencies . It tests the null hypothesis that there is no difference between the observed and predicted values of the response variable. Therefore, when the test is not significant, we cannot reject the null hypothesis and say that the model fits the data well. In other words, a good model is indicated by a high P value. The ratio of observed-to-estimated in-hospital mortality rates (OE ratio) was used as a measure of quality. The 95% confidence intervals (CIs) of the OE ratio were determined by the method of Katz et al. for risk ratio . When the OE ratio of a hospital is smaller than 1, the observed-mortality rate is lower than the expected rate, indicating that the quality of surgical performance is better than expected. In contrast, an OE ratio greater than 1 indicates a poorer performance. Table 2 shows the demographic data of the subjects. Most patients were old, showing a median age of 69 years, with the oldest patient being 97 years old. The most frequently performed procedure was open distal gastrectomy. Laparoscopic distal gastrectomy was performed for more than 10% of the distal gastrectomy group. Table 3 lists the incidences of postoperative complications occurring in this series. Among the 3,449 surgically resected patients, 782 complications occurred in 656 patients (19.0%). The most frequent complication was abdominal abscess and the second most frequent was anastomotic leak. Among these 3,449 patients overall, 68 patients (2.0%) died of complications during hospitalization. Figure 1 shows the relationship between the predicted in-hospital mortality rate (R) and the severity of postoperative complications. As R increased, the proportion of more severe complications significantly increased. As for the discrimination power of mE-PASS to detect in-hospital mortality, R demonstrated a good discrimination power of AUC (95% confidence intervals) at 0.80 (0.75–0.85) (Fig. 2). Subsequently, we analyzed the goodness of fit of the mE-PASS model using the Hosmer–Lemeshow test and found that mE-PASS demonstrated a high calibration power (χ2 value, 12.5; df 8; P = 0.89). We compared quality of care by analyzing the differences in OE ratios between six hospitals in which more than 200 patients were registered (Table 4). The OE ratios ranged from 0.44 to 1.8. Two hospitals had values less than 1.0, suggesting a better quality than expected. In contrast, three had values of more than 1.0, but none of the values exceeded 2.0. Finally, we analyzed the historical change in the quality of care for all subjects (Fig. 3). There was a tendency towards a reduction in the OE ratio over time, suggesting that the quality of care has been improved. This study clearly demonstrated a high discrimination and calibration power of mE-PASS in gastric carcinoma surgery. Although mE-PASS was generated using data from a wide variety of gastrointestinal procedures , there has not been any study examining its applicability to gastric surgery. The E-PASS scoring system was constructed on the hypothesis that overwhelming surgical stress exceeding the patient’s reserve capacity can lead to the disruption of homeostasis and various kinds of postoperative morbidity. E-PASS has been reported to have a predictive value in other fields of surgery, such as orthopedic surgery , vascular surgery , and lung surgery . Furthermore, our recent cohort study demonstrated that E-PASS has a high discrimination and calibration power in cardiac surgery as well (unpublished data). Therefore, the above hypothesis may be a universal principle for surgical treatment. Using the original E-PASS scoring system, the predicted mortality rates are obtained after the completion of surgery, because the scoring system requires intraoperative variables, such as blood loss and surgical duration. Therefore, we revised the model in order to obtain a predicted mortality rate preoperatively, and we designated this modified scoring system mE-PASS . This revision reduces the number of variables from ten to seven. Using mE-PASS, surgeons can preoperatively discuss the risk of surgery and the selection of procedures with their patients. For example, an 83-year-old man with severe emphysema, performance status index 1, and ASA class 3 was diagnosed with IIc type early carcinoma in the upper stomach. Preoperative contrast computed tomography (CT) did not demonstrate any evidence of lymph node metastasis. His PRS was 0.77. If he undergoes total gastrectomy, his predicted in-hospital mortality rate will be 7.2%. However, if he undergoes local resection, his predicted in-hospital mortality rate will be 3.3%. Of course, the predicted mortality rates represent only average risk and not the attending surgeon’s risk. However, we were able to exhibit a difference in risk between the procedures. Surgical audits comparing hospitals will drive quality improvement. The United States Department of Veterans Affairs (VA) established the National Surgical Quality Improvement Program in all VA hospitals performing surgery in 1994. The inception of these programs resulted in a significant reduction of postoperative morbidity and mortality rates . If we perform such a nation-wide program using mE-PASS in gastric carcinoma surgery, every hospital will try to minimize the OE ratio, leading to significant quality improvement. The surgical procedure actually performed is sometimes different from that initially scheduled, e.g., the preoperative plan is distal gastrectomy, but total gastrectomy is actually performed. When utilizing mE-PASS to perform a surgical audit, R should be calculated using SSSf for the surgical procedure that was actually performed. Otherwise, hospitals might obtain a lower value of the OE ratio by basing the calculation on a planned procedure that carried a higher risk than the procedure that was actually performed. Our study demonstrates quality improvement over time in the overall series. Some of the coagulation devices used for vessel sealing, such as harmonic scissors and the LigaSure™ (Covidien, Dublin, Ireland), have been utilized since the late 1990s. These devices have enabled the reduction of intraoperative blood loss and shortened the duration of surgery . The recent spread of these devices may contribute to quality improvement over time. Another possible reason for the quality improvement is the application of modified gastrectomy instead of D2 to early carcinoma, which has been recommended in gastric cancer treatment guidelines in Japan since 2001. Furthermore, distal pancreatectomy and splenectomy have not been performed routinely with total gastrectomy, because there have not been significant survival benefits reported but the morbidity rates are higher . These less invasive procedures may reduce postoperative morbidities in high-risk patients. The formula for mE-PASS was constructed using the data of operations performed between 1987 and 2002. Therefore, overestimation of mE-PASS was observed in the late period of the present study, from 2005 to 2007. The quality of care determined by the OE ratio may be further improved in the future. Therefore, re-calibration of mE-PASS should be considered periodically. In conclusion, this study demonstrated the predictive value of mE-PASS in gastric carcinoma surgery. This system can be applied to clinical practice, clinical research, and the assessment of quality of care. All of these efforts will contribute to improving the quality of gastric carcinoma surgery in the future. This study was supported by a grant for National Hospital Organization Multi-Center Clinical Research for Evidence-Based Medicine. The authors declare that there are no conflicts of interest related to the contents of this manuscript.